This easy to install kit comes stock with everything you need to secure your laptop from theft. The keyed lock, with multiple keying options, makes it the right choice for corporate, educational, and government agencies. Guardian locks are the security solution trusted by top universities, fortune 500 corporations, and government agencies to keep valuable laptops safe and secure. Guardian locks have been designed with improved pick resistance and more available key numbers. For increased security, you have the choice to have your lock keyed-alike, keyed-different, master-keyed, and even request grand master-keyed at no upcharge. 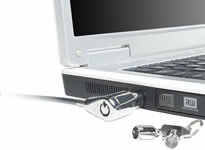 The built-in scissor clip makes it easy to install the lock into the standard security slot on your laptop. 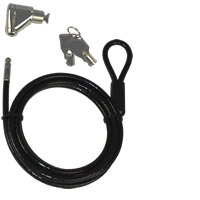 Key numbers can be matched to other kits in this product line with different options and security levels. Manufacturing improvements allow for custom key options in a few days, not a few months. The Guardian 820 style lock has a scissor clip built right into the lock to fit into a standard security slot. 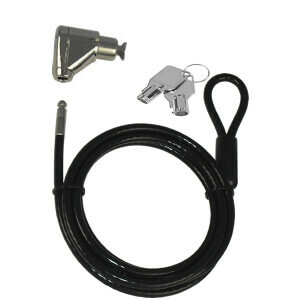 This lock is perfect for situations where you need to unlock the equipment often and want the convenience of a one piece lock. Our tough, durable 6’ steel security cable is strong enough to provide reliable protection, but light and flexible enough to make it the perfect cable for laptop security. It’s made from 5⁄32” thick, heavy duty, aircraft cable and coated with black vinyl for a 1⁄4” finished diameter. 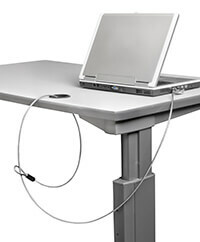 Security slots are generally located on the side or rear of most laptops. Once located, insert the scissor clip end of the lock into the security slot and press the button to lock it to the laptop. To release the lock from the laptop, insert the key and turn to the right. As a bonus, if you need to secure multiple pieces of equipment, you can remove the lock from the cable by turning the key to the left.